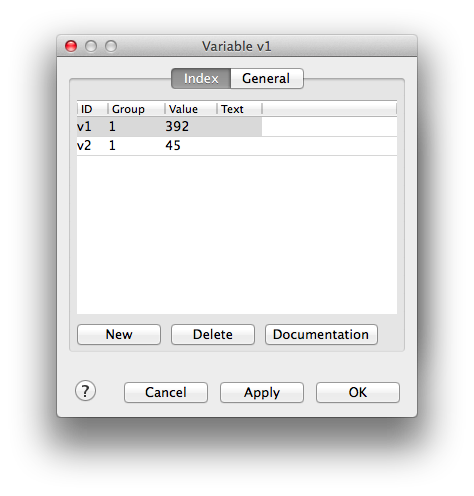 User variables can be used in combination with Actions and Conditions. This chapter describes the variables that are to be defined by the user. In addition Rocrail offers even more than 30 "build in" variables whose values are determined by the operating process. 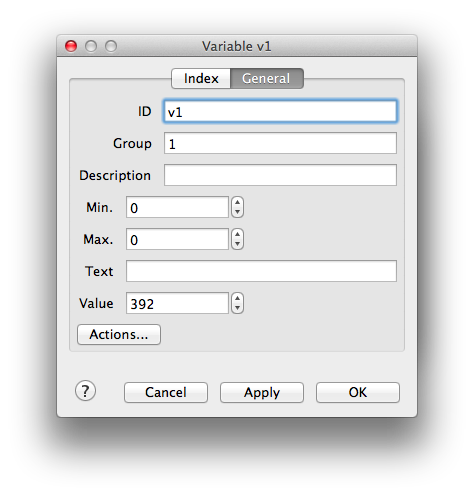 The ID is used through out the Rocrail program as a unique key for referencing this variable. The range used for generating a random number. Max. must be set greater than Min. Only the numeric value can be used as action state. Actions are checked after a command has been issued. Timer variable actions are only checked in case it is in active timer mode triggered by start command. value Set a new numeric value. add Add a value to the numeric value. subtract Subtract a value from the numeric value. text Set a new text. random Generate a random number in the range of min./max. start Starts the timer; The value will be increased at every tick. The start value must be set in the parameter field. The timer tick interval is dependent of the Action Timer option. min Sets the min. value. max Sets the max. value. The operations will be processed from left to right disregarding the mathematical rules. Values, variables and operators must be separated by one blank. Text values are converted to an integer and will default to zero if it contains text only. This has only affect in automatic mode. The variable will be automatically created if it does not already exist.